Small businesses need a robust and cost effective server that can scale as they grow. 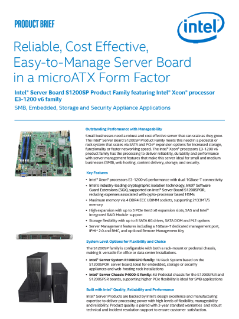 The Intel® Server Board S1200SP Product Family meets this need in pedestal or rack system scalable via SATA and PCIe* expansion options for increased storage, functionality, or faster networking speed. The boards are based on Intel® Xeon® processors E3-1200 v6 product family with the processing to deliver ...reliability, durability, and performance plus server management features that make this server ideal for SMB, embedded, and storage and security appliance applications.